For additional information about this book, visit the website michaelfields.com. If you grew up in Nashville, Tennessee—the Buckle of the Bible Belt—in the 1960s and had parents who were staunch Southern Baptists, your upbringing likely was strict and quite regimented—Sunday school, church, weekday prayer meetings, and numerous rules for being a well-behaved child. If you happened to be “metaphysically minded,” navigating your teen years in such an environment was probably tricky at best. And if you also happened to be homosexual, life was most likely rather challenging. 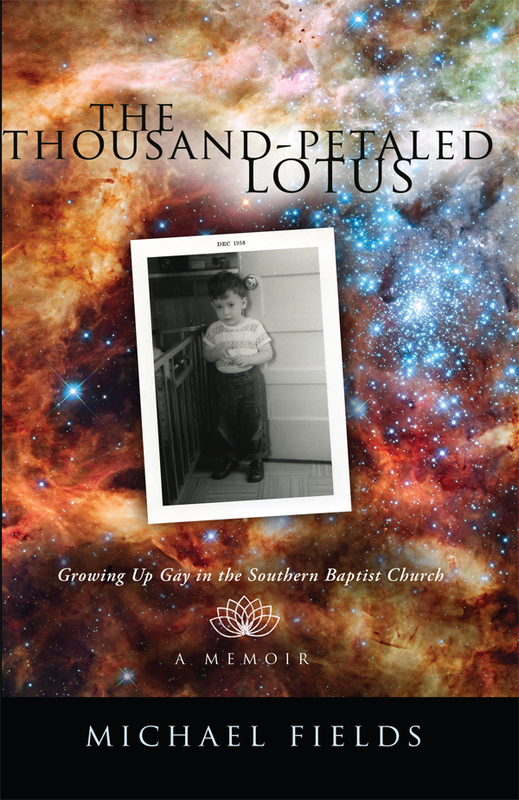 The Thousand-Petaled Lotus: Growing Up Gay in the Southern Baptist Church is Michael Fields’ poignant, thought-provoking and hilarious memoir, a story that starts on the first day of creation, leaps ahead quickly to Fields’ childhood, and follows him through his high school years. Along the way, he shares stories of his sexual awakening and awareness, beginning with his first crush on a comic book hero called the “Martian Manhunter” when he was age four and continuing through an adolescence filled with anguished prayers that Jesus would cure him of homosexuality. This is not, however, a steamy tell-all book about a gay man’s sexual exploits. It is, quite wonderfully, Fields’ personal and spiritual journey, one that includes metaphysical pondering, questioning of faith, associating with erudite mentors and friends, and ultimately, arriving at his final destination in the kingdom of heaven. You do not need to be from the South to relate to this Southern tale. The Thousand-Petaled Lotus poses universal questions and shares experiences that each of us can appreciate, and Michael Fields has deftly woven it together with his charm and distinctly Southern wit. Michael Fields was born and raised in Nashville, Tennessee. He attended Deep Springs College and Columbia University before earning his masters degree in social work at Fordham. Michael is employed as a program director at the Department of Veterans Affairs. He lives in New York City with his partner, now husband, of thirty-five years.